The polar and eco-vehicle called ‘Wind Sleigh’ will make the first Spanish exploration and scientific campaign in the Antarctica from next December. It will collect data for the Helios project, a research to identify useful microorganisms in biotechnology by the Institute for Integrative Systems Biology (I2SysBio) in the Science Park of the Universitat de València. The ‘Wind Sleigh’ is a wind, environmentally friendly, economically efficient and effective for research under harsh conditions vehicle that will take 4 polar explorers to one of the most unknown and bleak areas in the Antarctica. The aim of the expedition is to collect data for 10 national and international research projects on different topics such as Galileo satellite constellation by the European Space Agency (ESA) or tests of units travelling to Mars looking for life in ice, pollution or climate change. Among those, an experiment inside Helios project is found. It is aimed to characterise communities living in extreme ecosystems and identify microorganisms profitable in biotechnology through sequencing techniques. The team is carrying out some bioprospecting works in natural and artificial extreme environments such as deserts and solar photovoltaic panels, looking for bacteria, gens and enzymes profitable in the industry due to their potential to stand up to the harsh climate conditions they are subjected to. 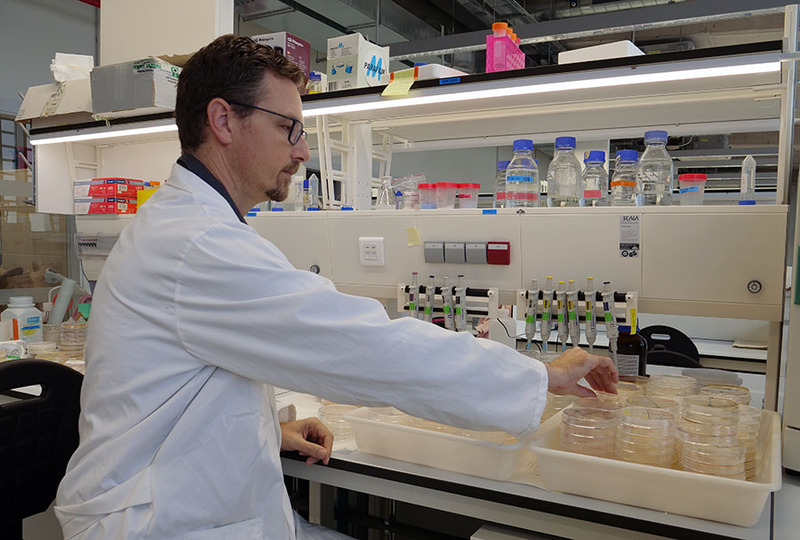 “Unexplored Antarctica offers us the opportunity to study extremophile microbial communities in remote areas of the Antarctica” states Manuel Porcar, researcher in the Helios, a UV and CSIC project. “The key is that the sleigh has solar panels able to catch extremophile microorganisms and, by doing so, we will know the extremophile microorganisms that live in an area completely unexplored” he adds. Furthermore, Unexplored Antarctica will collect data for 9 projects of different organisms such as the European Space Agency, the University of Maine (USA), the Autonomous University of Madrid, the University of Alcalá de Henares (UAH), UAH/INTA-CSIC, IDAEA/CISC and Astrobiology Centre (INTA_CSIC), as well as a research project by Alfonso Dávila, on a postdoctoral stay in the NASA. The expedition will take a 2,000 km journey through a triangular route never made before without motorised means and external assistance. Headed by the polar explorer Ramón Larramendi (developer of the ‘Wind Sleigh’), it will depart on December 4 from the Russian base in the Antarctica Novolazárevskaya into the continent headed to Dome Fuji – the second highest point in inner Antarctica at a high of 3,810 m and the location of a Japanese base, where -93.2º C have been registered. Even though the expedition is carried out during the austral summer, the team will have to withstand temperatures under -50º C. The peak of the dome will be reached from the North-American Base Plateau and then the way back to Novolazárevskaya will start, during the 2nd week of February 2019. Larramendi will travel with 3 expert Sleigh pilots, trained to accomplish the tasks for the expedition. They are Ignacio Oficialdegui, biologist and expert on renewable energies; Hilo Moreno, guide and assistance in the Spanish Antarctic Base Juan Carlos I; and Manuel Olivera, industrial engineer. Sponsored by the Prince Albert II of Monaco Foundation and Tierras Polares travel agency, the expedition is funded by a crowdfunding campaign by 340 people on an individual basis or on behalf of companies and institutions. Nature journal pointed out the initiative as a significant option to achieve a polar clean science.